The Conservatorium Meat Market is famous for its finest selection of local and best-sourced worldwide meat. The meat market offers fresh, sustainable and seasonal meats that will all be prepared on the Josper Charcoal Grill. very bad staff or service. I am very disappointed. Sure I will avoid Brasserie next time. Long waiting, each time asking, think they all trainee from the hotel school. The location is really nice, the staff is great and the ingredients are excellent. Really good dishes in an elegant Brasserie. High recommended! We were welcomed by the very warm and friendly lady Colette with a bright smile. Despite of my last minute booking, she helped us kindly to make it possible to have the Van Gogh Afternoon Tea, which turned out to be a very unforgettable experience for us. The service, the setting of the afternoon tea, the food itself and the environment were all top-notch. Being food, art and classical music lovers, having the delicate afternoon tea inspired by Van Gogh in the historical building which used to be the Sweelinck Conservatorium, was a perfect combination for us! We had a fantastic evening! Waiter Bram did a great job and there was nothing missing to a perfect dinner! The fish market was out personal highlight. We had a delicious lunch. Portions are small but refined and well prepared. Ambiance is excellent (live music, flute and piano on Sunday). Really nice food - despite the many negative reviews - with an excellent personal service with people who care about their guests in a great ambiente! Prachtige witte wijn gehad [LES VIGNERONS DU NARBONNAIS ‘DUMANET’, LANGUEDOC 2016], en met name de gestoofde haas (STEW OF HARE) in bladerdeeg en pate was fantastisch. I love the Conservatorium --- although in truth 90% of what I love is the space. The food is okay but bland. The salad buffet has been halved in size and is (never was) very appealing. The service is shocking. I have been at least ten times and it never gets better. There is no dedicated member of staff for each table. They all have a go --- with the result that something inevitable goes wrong or gets forgotten. There are always customers chasing staff around the room. My recommendation is to go for a light bite when you have time to spare, lower your expectations, and enjoy the gorgeous space, which remains a little oasis in the museum district. The spa downstairs is nice too (btw) and the cosmetics store SKINS is the best in town. Enjoy the total experience. We went there with colleagues. We had a great moment, about the cocktails but also about the food sensation :) Great great cocktails ! You have to try. Everything was right, as usual, exwcept... it was a wrong order side and I was oblied to eat my main dish later than my friends. Gentle apologies, but serious incovenient! 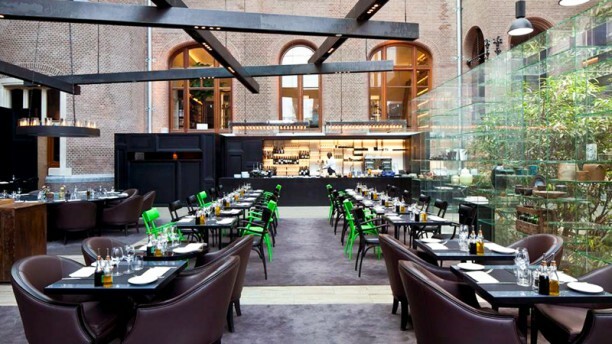 NIcer atmosphere, excellent service and cuisine, dishes on time to go to the concert in the Concertgebouw. It is clear before the concert you need spend some time in the Conservatorium! I had another delightful experience in the restaurant. My guests were very happy too. Thank you. I will be sure to come again. The food was so bad -shrimps for starters-kalfwangetjes for main. this is the second time that the food was really bad. I would be surprised if not already they loose a lot of customers because of the serious bad quality.